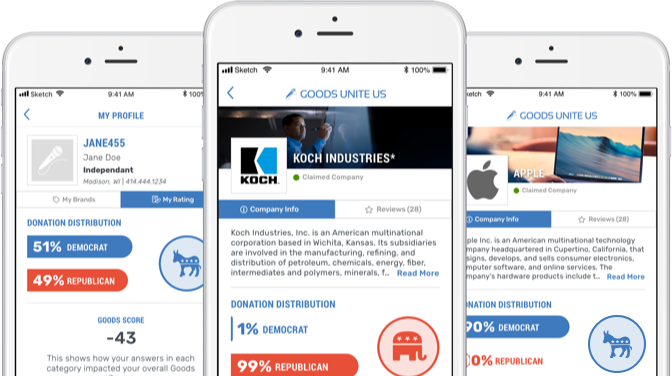 See the POLITICAL donations of thousands of brands and companies! Is your favorite company red or blue? Does it fund Donald Trump, Beto O’Rourke, Mitch McConnell, or Hillary Clinton? Just download our FREE app by clicking here to find out. Enter a company or politician name. And we’ll tell you what we know about the political donations made by thousands of companies and their senior employees. See information on Apple, Walmart, Patagonia, Koch, AARP, New Balance, Starbucks, AT&T and thousands more! The app has information on clothing brands, home goods, car companies, restaurants, universities, sports teams and much more! Over 100,000 people have downloaded it already. And it’s the highest rated political app in the App Store.